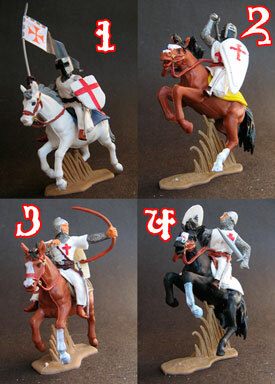 4 figures in 4 poses, factory painted. 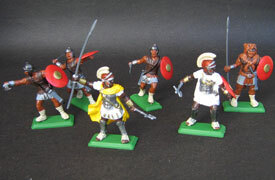 The weapons and the color of the bases and the shields could be different. 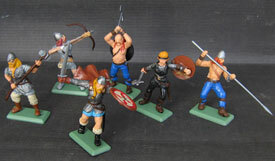 6 figures in 6 poses, factory painted. 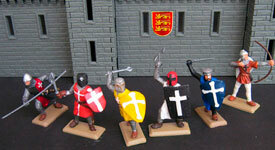 The color of the bases, the shields and weapons, the colour's clothes of each figure and the flag could be different. 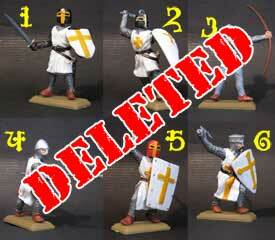 4 figures in 4 poses, factory converted figures, factory painted. 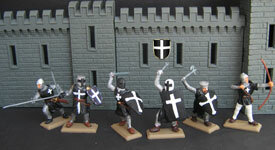 DSGLWC11/6-Hospitallers Knights in black clothes. 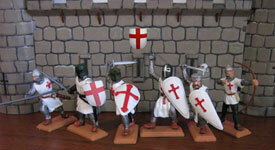 DSGLWC11/8-Hospitallers Knights in red clothes. 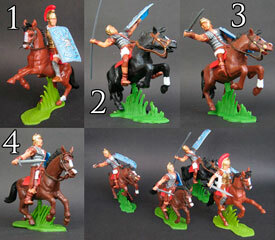 The color of the bases, the horses, the shields and weapons of each figure and the flag or banner could be different. 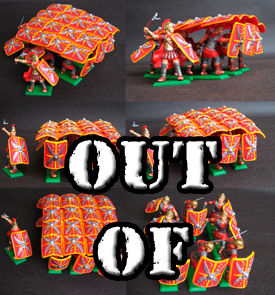 4 figures, factory converted figures, factory painted. DSGLWC12/6-Hospitallers Archers in black clothes. DSGLWC12/8-Hospitallers Archers in red clothes. 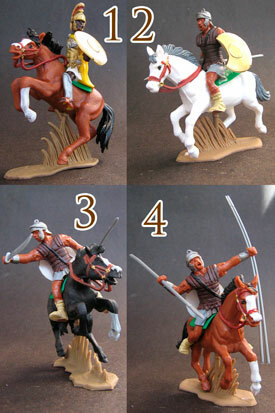 The color of the bases and the horses, could be different. 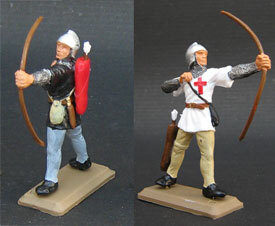 6 figures in 1 poses, factory painted. DSGLWC13/6-Hospitallers Archers in black clothes. DSGLWC13/8-Hospitallers Archers in red clothes. 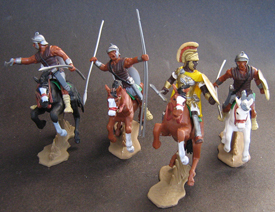 The color of the bases, could be different. 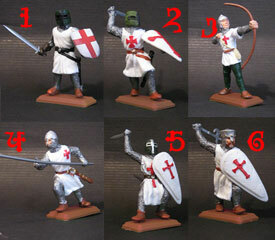 6 figures in 6 poses, factory painted. 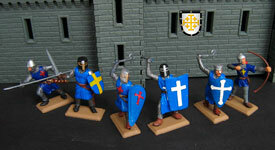 Witht the blue clothes of the Knights of the Reign of Jerusalem. 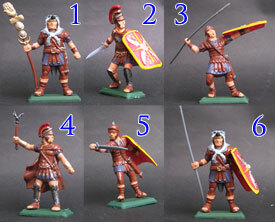 The color of the bases, the shields and the weapons of each figure could be different. 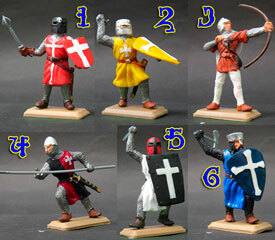 6 figures in 6 poses, factory painted. 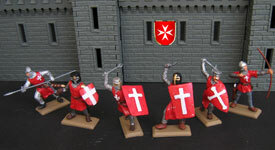 Witht the red clothes of the Hospitallers Knights. 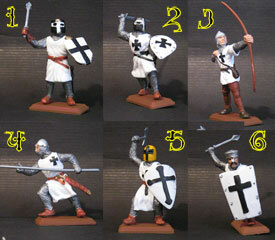 6 figures in 6 poses of crusaders knights in coloured tunics, factory painted. 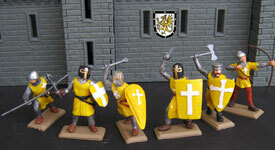 Maybe the King Richard Lion's Hearth Troops? 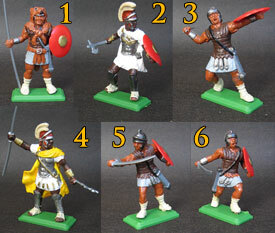 The color of the bases, the color of the tunics, the shields and the weapons of each figure could be different. 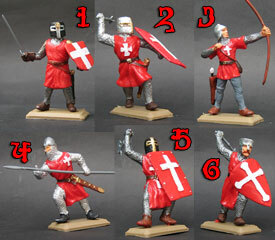 6 figures in 6 poses, factory painted. 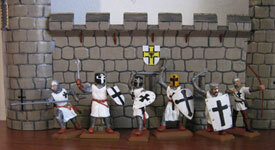 Witht the black clothes of the Hospitallers Knights. 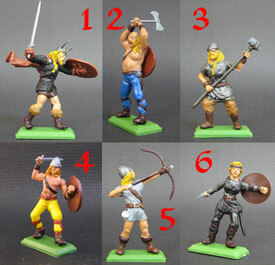 6 figures in 6 poses, factory painted. Witht the clothes of the Knights of the temple. 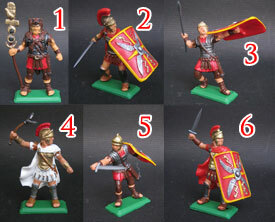 6 figures in 6 poses, factory painted. With the clothes of the Teutonic Knights. 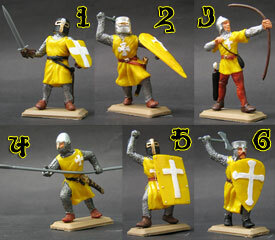 6 figures in 6 poses, factory painted. 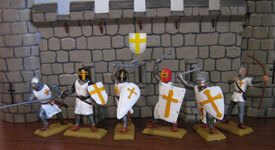 Witht the clothes of the Italian Knights. 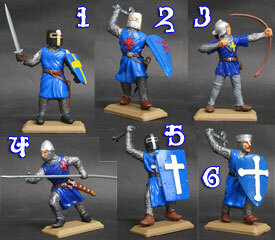 6 figures in 6 poses, factory painted. With the clothes of the French Knights. 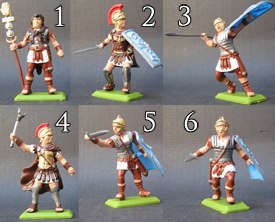 6 figures in 6 poses, factory painted. With the clothes of the Knights of Flandes. 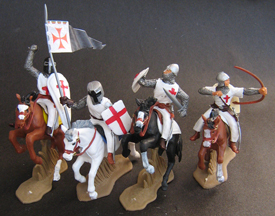 Crusaders Knights with flag and banners. 2 poses available for each. 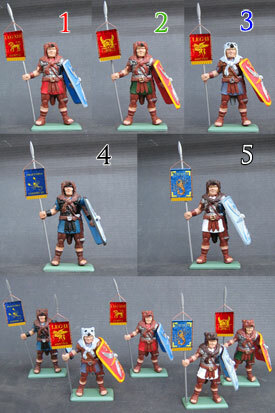 The color of the bases, the shields and the flags or banners could be different. 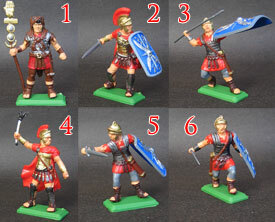 6 figures in 6 poses, factory painted, red clothes. The color of the shields could be different. 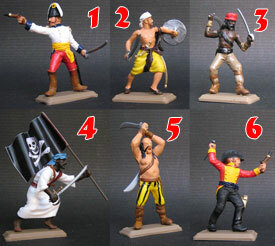 6 figures in 5 poses, factory painted. 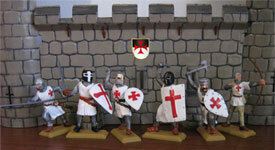 , red clothes with red shields. 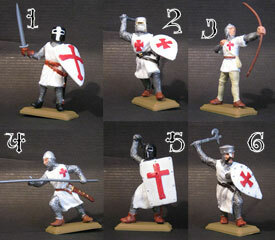 6 figures in 6 poses, factory painted. 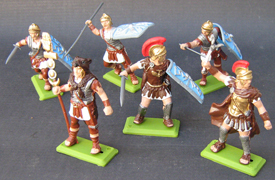 The Praetorian guard. Black clothes with red shields. 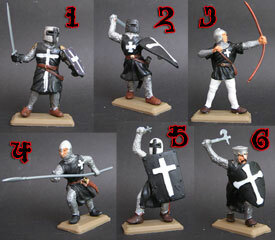 6 figures in 6 poses, factory painted. 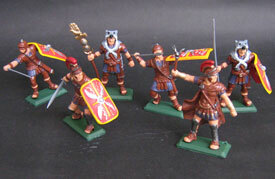 The Praetorian guard #2 . 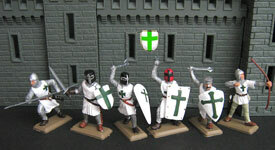 White clothes with light blue shields. 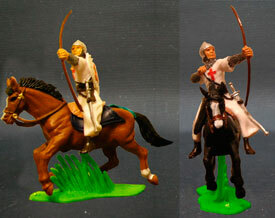 4 figures in 4 poses, factory converted figures. DSGLWR08/1- Red clothes with red shield. 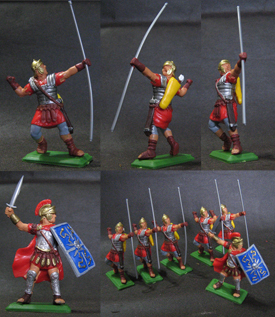 DSGLWR08/14- Praetorian guard #2, white clothes with light blue shield. 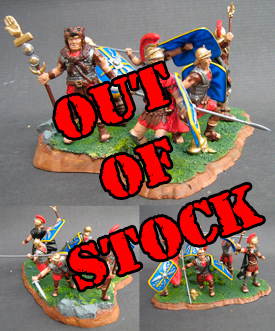 6 figures in 2 poses, 1 centurion and 5 archers factory painted. 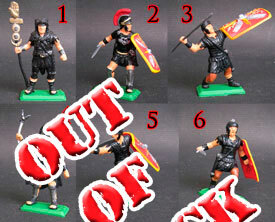 DSGLWR07/4 = Figure 4, Praetorian guard, black clothers. 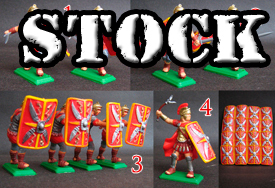 6 figures in 6 poses, factory painted, mounted in the new spectacular DSG bases for the Romans set, forming a small diorama. 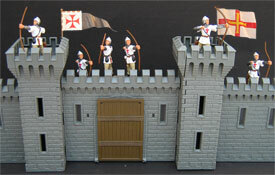 The base is made in resin and factory painted. Clothes colours could to change. 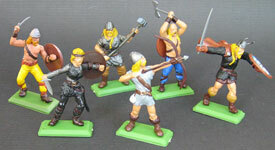 6 figures in 6 poses, factory painted, mounted in the new spectacular DSG bases for the vikings set, forming a small diorama. 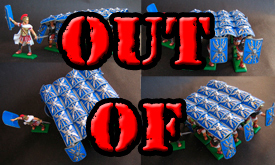 The base is made in resin and factory painted. 6 figures in 1 pose, factory painted. 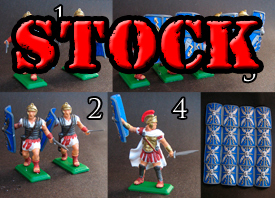 All the sets are availables in metallic bases. 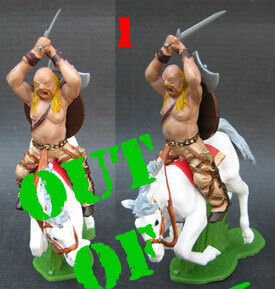 DSGLWV05/DSG Deetail: VIKINGS on Horseback. 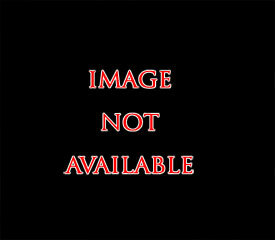 4 figures in 4 poses, one of them, the woman, carrying the Eagle flag. 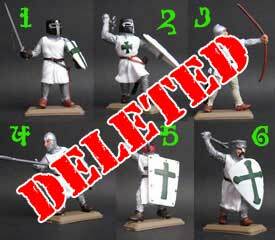 factory converted figures. 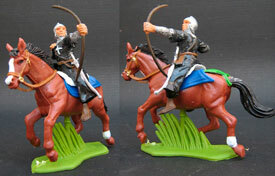 RSCLWV04/RS Conversions: VIKINGS on Horseback , The Death Riders. 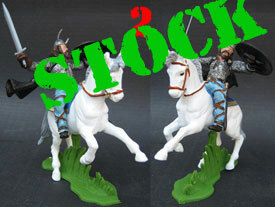 2 custom mounted figures in 2 poses, from DSG vikings figures and resin made legs. 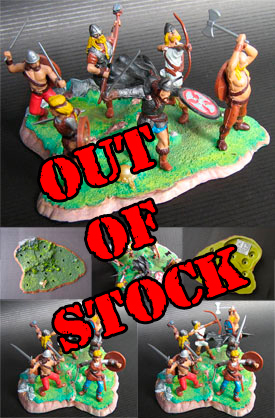 Only few figures of each available.